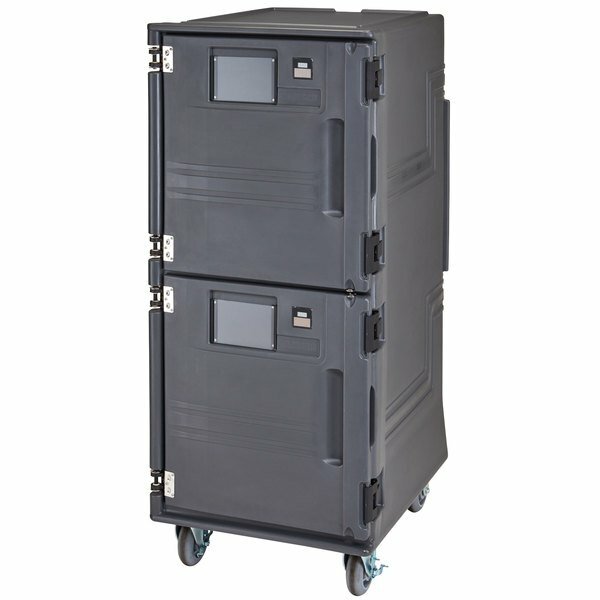 Cambro Pro Cart Ultra. We see a chef prepping some food. He's placing it in food pans. 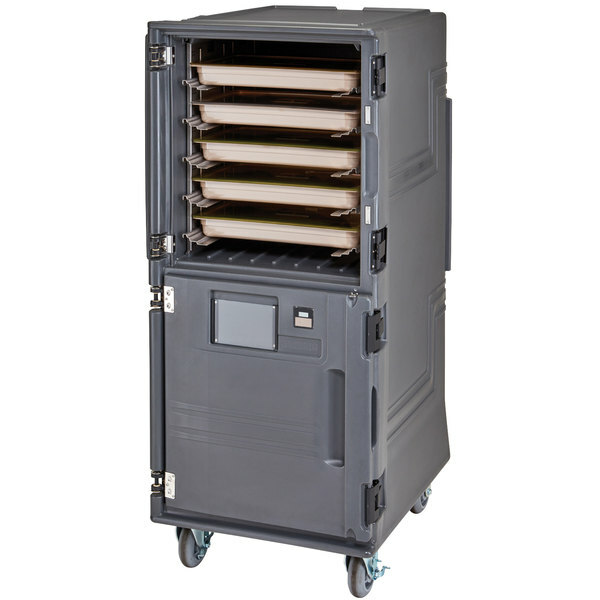 Dual compartments hold food pans for hot and cold food in the same cart, at the same time. Dutch doors keep the units separate. 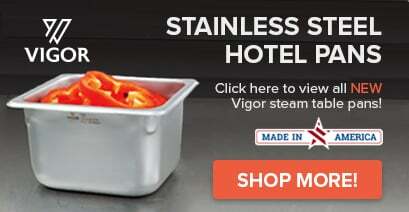 Adjustable stainless steel rails hold sheet pans for hot applications and cold applications. Easy maneuvering for all your catering and banquet needs. We see a caterer unloading the cart and putting the food pans in chafing dishes. Magnetic quick-close on the door for convenience. Nylon latches to secure contents. 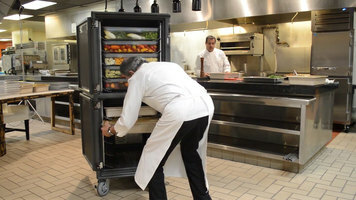 Cambro Pro Cart Ultra. 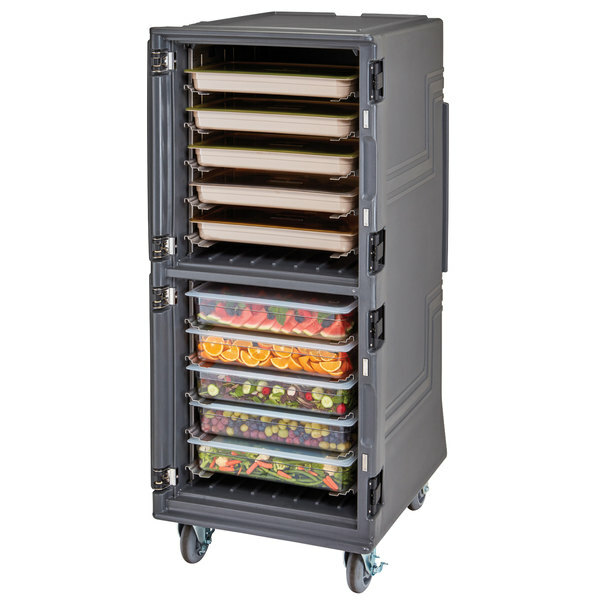 The Cambro Pro Cart Ultra is a convenient addition to any catering or banquet facility. With dual compartments that can hold both hot and cold food simultaneously, the possibilities are endless! 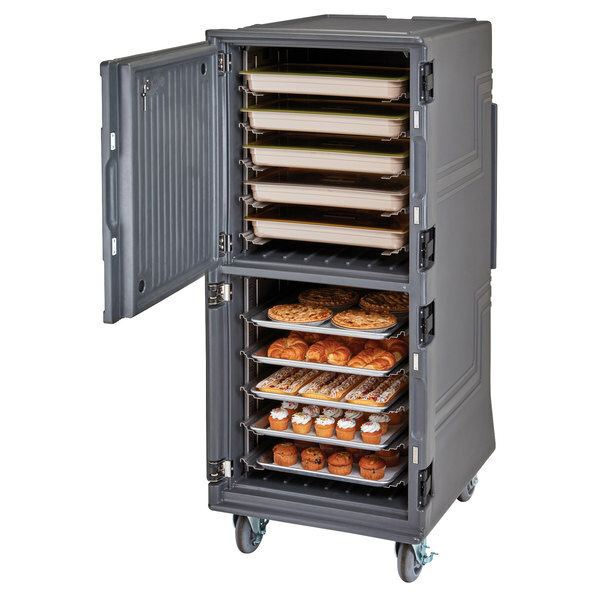 Transport fruit, salad, pastries, and other chilled food to catered events, concession stands, or even food trucks with this Cambro PCUCC615 Pro Cart Ultra® electric cold holding pan carrier! 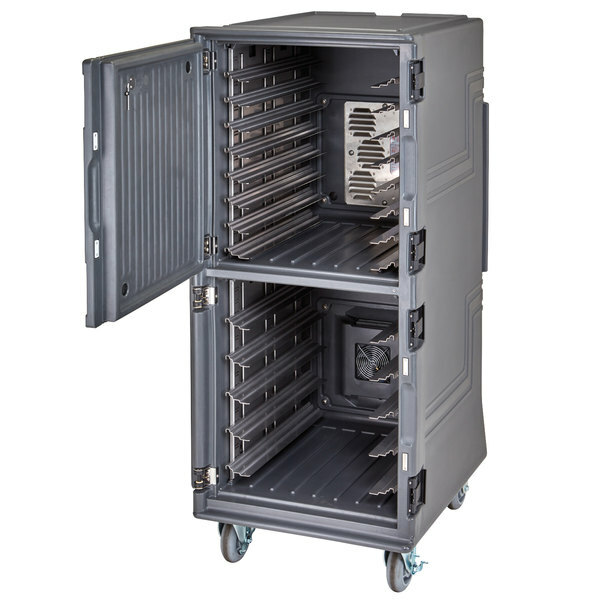 Boasting unique thermoelectric cooling technology, each of the cart's 2 compartments are able to cool down to 32.5 degrees Fahrenheit without a cumbersome compressor. Each compartment is also equipped with a digital controller that allows the temperature to be adjusted to 40 degrees Fahrenheit for added versatility, while solar digital thermometers make it simple to monitor the temperature at a glance. For added convenience, a combination of LED indicators and display messages let you know if there are probe or internal parameter errors, while also triggering alarms for high or low temperatures. 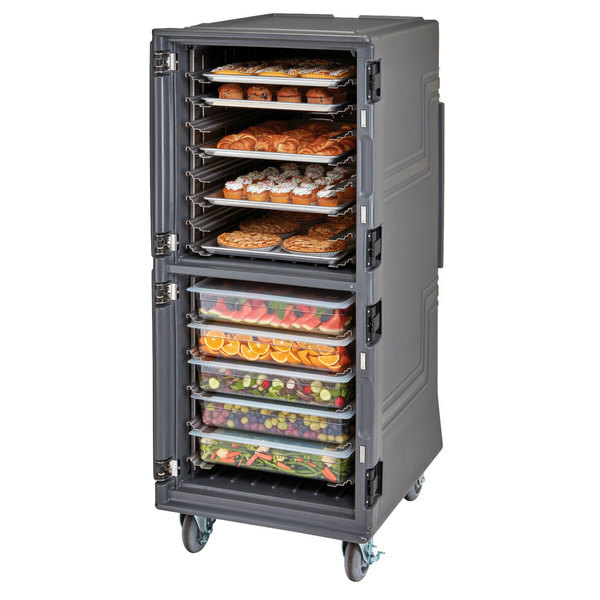 Thanks to the unit's universal adjustable rails, this cart can accommodate sheet pans, food pans, pizza boxes, trays, or a virtually limitless combination of them all! There are 7 pairs of rails in each compartment that can be configured to hold full and half size sheet pans, full hotel pans, market, bakery, and dietary trays, and even large 16" pizza boxes. CFC-free polyurethane insulation is contained within the charcoal gray polyethylene shell to deliver reliable temperature maintenance that ensures food safe temperatures for four hours or more when disconnected from electricity. A 5" x 8" menu pocket on the front of each compartment also helps maintain temperatures by allowing you to identify the contents within without opening the door. 4" nylon latches provide easy access to your food and secure it during transportation, while the door's gasket-free design means easier cleaning and fewer replacement parts to worry about! 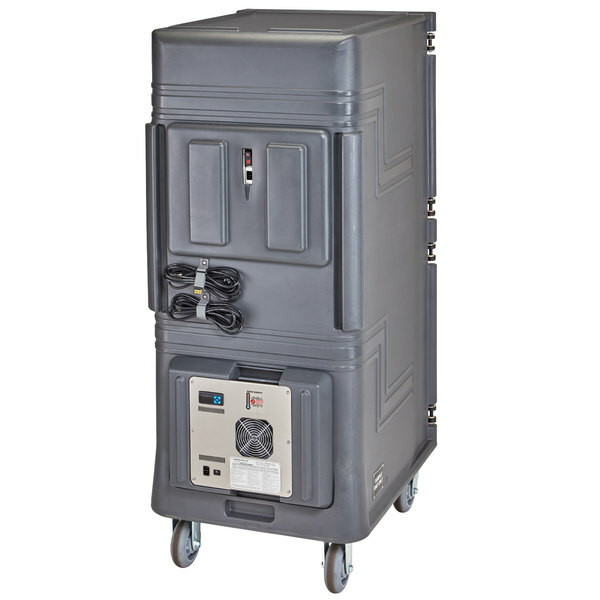 The ergonomic molded-in handles will never break like comparable extruding handles, and they combine with 6" heavy-duty casters to make maneuvering a breeze for operators of all heights. There are also holding straps on the back of the cart so you can safely store the power cord prior to transporting. Two 110V electrical connections are required for operation.